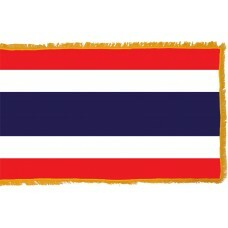 The Thailand flag features five horizontal bands in the colors of red, white, blue, white, and red. 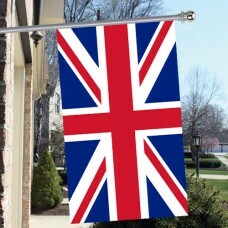 The blue stripe that is in the middle of the flag, is double the width of the other stripes. The red color represents the people and the country and the blood that was shed to protect the country. The blue color represents the Thai monarchy as well as being the national color of Thailand, and the white color represents The Buddhist religion, which is the primary religion in Thailand. 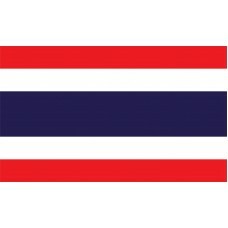 The red, blue, and white colors are used on the Thailand flag to honor their WWI allies, which were Great Britain, France, USA, and Russia, who all use the red, white, and blue colors on their flag. 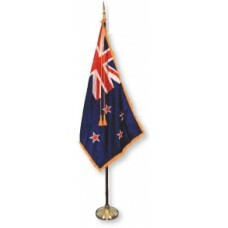 The flag represents "nation-religion-king" which is the unofficial motto of the country. The Thailand flag is also referred to as the "Triaranga" or "Triarong" which means "tricolor" and was adopted on September 28th, 1917, which makes it one of the world's oldest flags. Thailand is a country that is located in Southeast Asia that shares borders with Laos, Cambodia, Mynamar, and Malaysia. The largest and capital city of Thailand is called Bangkok. Thailand is also known as "Prathet Thai" which literally translates as "land of the free" and is home to 1430 islands. Thailand was originally known as "Siam" until its name changed in 1939 and it is the only country in Southeast Asia that has never been colonized by the British. Thailand is the largest producer of tin and the second largest producer of rice and a lot of the economy is based around this as well as tourism. It is home to approximately 6,000,000 tourists a year. Bangkok is considered to be the world's most visited city and was originally known as the "Venice of the East" due to the number of canals that it used to have. As the city has expanded, however, and got more populated (the majority of the Thailand's population now live here), new roads and streets and buildings saw the removal of the canals. The number one attraction of Thailand is in Bangkok and is the "Grand Palace" which has been the residence of the Kings of Siam from 1782-1925. It is made up of numerous buildings, gardens and courtyards. The largest gold buddha (which is known as "Phra Phuttha Maha Suwana Patimakon" and weighs 5.5 tons) is located in Bangkok in the temple of "Wat Traimit." Nobody knew that the Buddha was made of gold or its worth for approximately 200 years, as it was covered with stucco and colored glass to conceal the gold. Thailand is home to approximately 35,000 temples and has the largest crocodile farm in the world, the longest suspension bridge, the tallest hotel, and the largest restaurant in the world. It is also known to be the prostitution capital of the world. But at war we're no cowards.